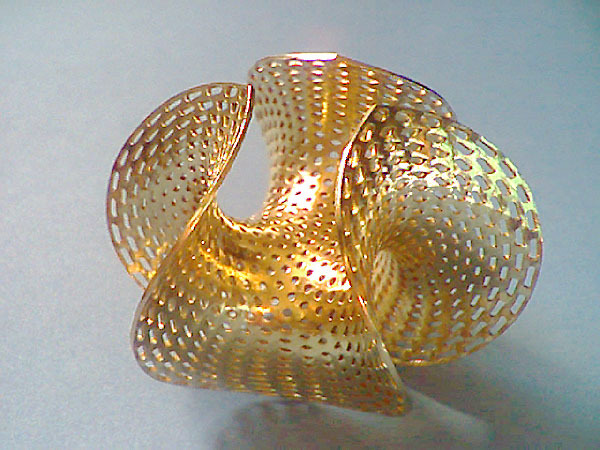 Sculptor and jeweller Benjamin Storch combines his skill in metalworking with an in-depth knowledge of mathematical plotting and CAD applications. 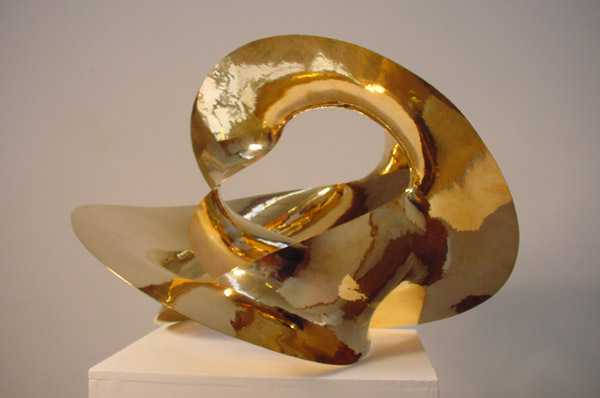 He hand-forges beautifully curving abstract forms often created from mathematical formula or exploring the principles of anticlastic form. 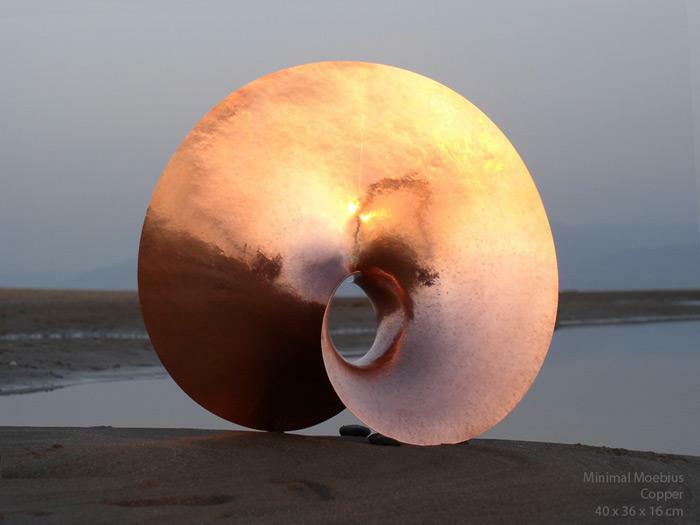 ‘For the past ten years my work has been focused on the creation of sheet metal forms based on dynamic “orbital” curves inspired by imagery from dynamical systems in physics and nature,’ he says. The workshop primarily focusses on the process of ‘anticlastic forming’, where fluid, dynamic surfaces are achieved by stretching the peripheral areas of a sheet metal surface. The guiding principle is to follow the metal’s inherent dynamic properties, without starting with a fixed idea of a finished form. Despite metal’s relatively high resistance, its ductility and special tensile properties guide and structure the creative process and lead to a unique vocabulary of form. For the past ten years my work focused on the creation of sheet metal forms based on dynamic, ‘orbital’ curves. This was initially inspired by a series of diagrams drawn by a device recording the interaction of two pendulums, a Harmonograph. The diagrams give the illusion of ribbon-like surfaces that twist freely while retaining a sense of rhythm and symmetry. These dynamic principles based on harmonic ratios had a strong conceptual impact on my work. 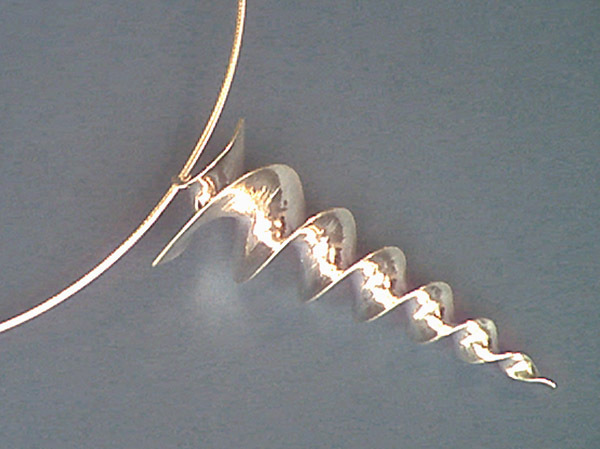 Rather than seeing them as superimposed sine waves, they seemed to embody a simple force field, where the centres of gravity of the pendulums represent two attractors and the curve traces out an orbit. I found similar patterns occurring in the simulation of the ‘three body problem’ in astronomy, where one moon orbits two planets. Similar principles were also found in other computational simulations of dynamical systems in physics, where a trajectory weaves back and forth between two attractors. Personally, these dynamic principles reflected an inner sense of non-verbal perception, of experiencing emotions as attractive and repulsive forces in an almost spatial, kinesthetic way. While dance might be the most obvious medium to translate these perceptions, my background in silversmithing led to the attempt of capturing this sense of motion in metal. This turned into a PhD research project on the creation of surfaces of negative, hyperbolic curvature in sheet metal at the School of Jewellery in Birmingham, completed in 2004. Aided by an Arts Council Production Grant in 2006, I started to create work for public spaces. Forming steel at a thicker gauge has been a challenge and I keep improving the tools required to do so. Alongside private, corporate and public commissions, I have been running several community – and school-based projects and I very much enjoy working with young people and helping them realise their creative ideas. I have also lectured at universities in Birmingham and Bangkok and run master classes for adults in Tuscany, Italy. 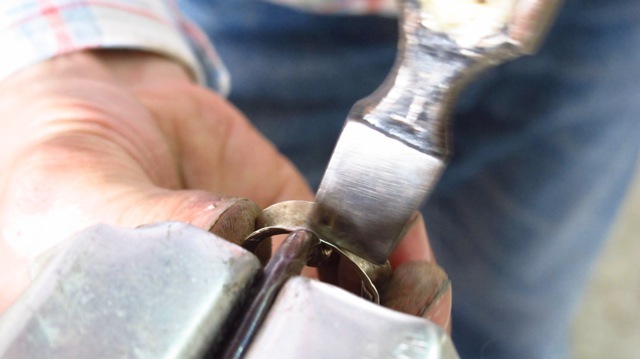 Participants can work at any scale from jewellery size to about half a meter in diameter, though a contribution to the material costs would be appreciated for ambitious sizes. You can also bring your own precious metals. Three double guestrooms are at disposition in the old part of Villa Le Guadalupe, sharing a large kitchen and a bathroom. A separate entrance leads directly to the garden where wi-fi is also reachable.